I prepared the recipe from the 48th episode of Good Eats several weeks ago, but I am only now sitting down to finally blog about it. Long story short, it’s been a rough go for us ever since Ted’s cancer surgery, with him having several complications. Since his surgery on September 24th, he has spent 20 nights in the hospital, divided between two visits. He is home now, but still battling a partial intestinal obstruction that the doctors hope will eventually resolve itself; if not, more surgery may be necessary. Sigh… We have to turn the corner eventually. Right? My dad has never been a big fan of pot roast, or as he calls it “wet meat.” Since it was not his favorite thing, we didn’t eat a lot of pot roast growing up, though I do like it. As an adult, I also do not make pot roast regularly, but I was definitely intrigued by Alton’s recipe. Plus, pot roast is a perfect thing to make as we transition fully into Fall. 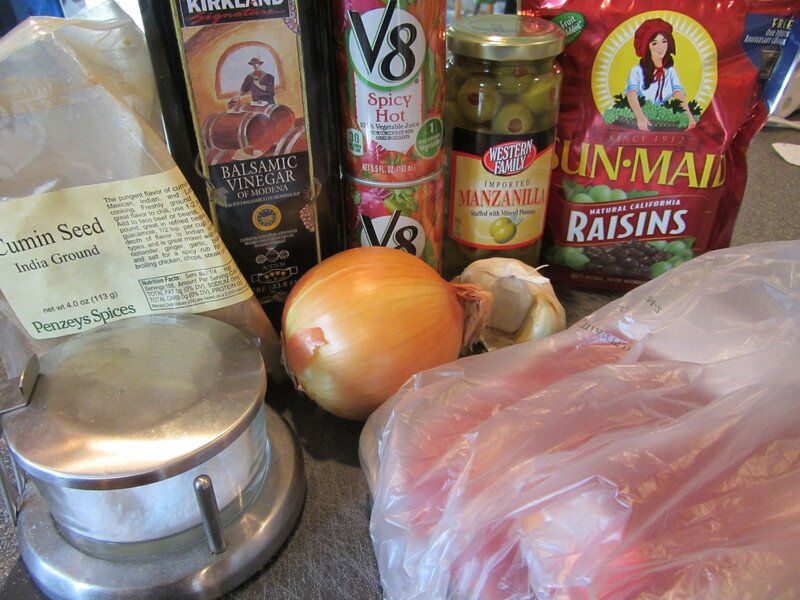 Ingredients for Alton’s pot roast: 2 pound blade chuck roast, Kosher salt, cumin, balsamic vinegar, tomato juice, onion, garlic, green olives, and dark raisins. Alton is pretty specific about the cut of meat you should use for his pot roast. 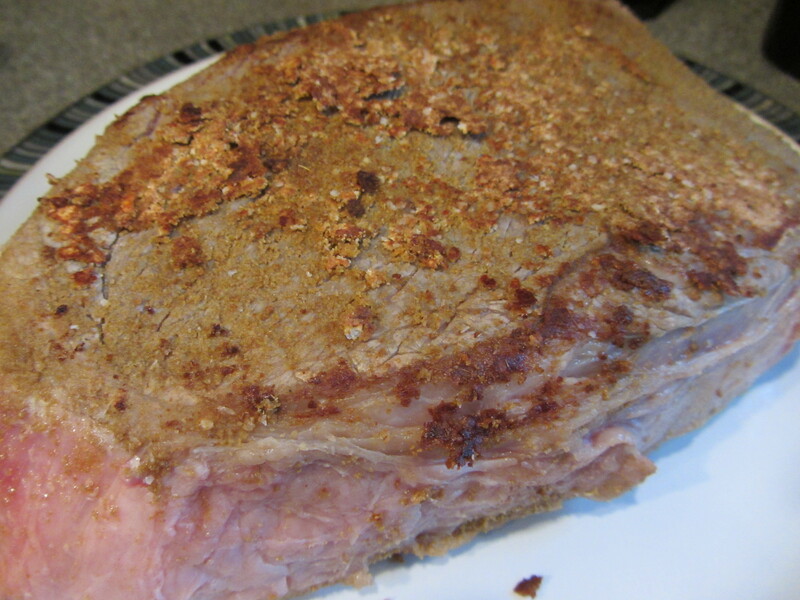 Ideally, you want to get a 2-pound chuck roast that has “blade” in the name. You also want the meat to be cross-cut like a steak, so it is fairly thin, and you should opt for a bone-in cut that has the largest bone possible; the bone will yield a more tender roast. 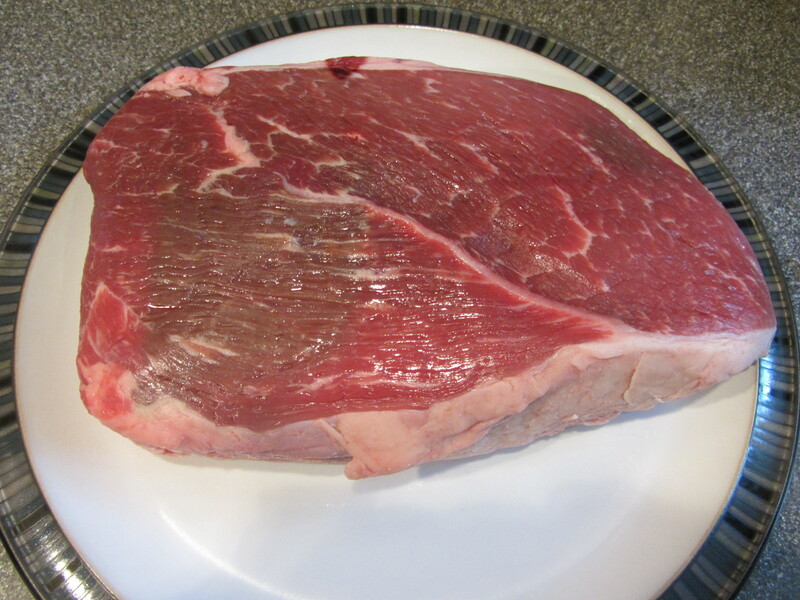 Alas, I could not find the exact cut of meat Alton specified, even after going to a few grocery stores, so I had to settle for a thin boneless chuck roast. 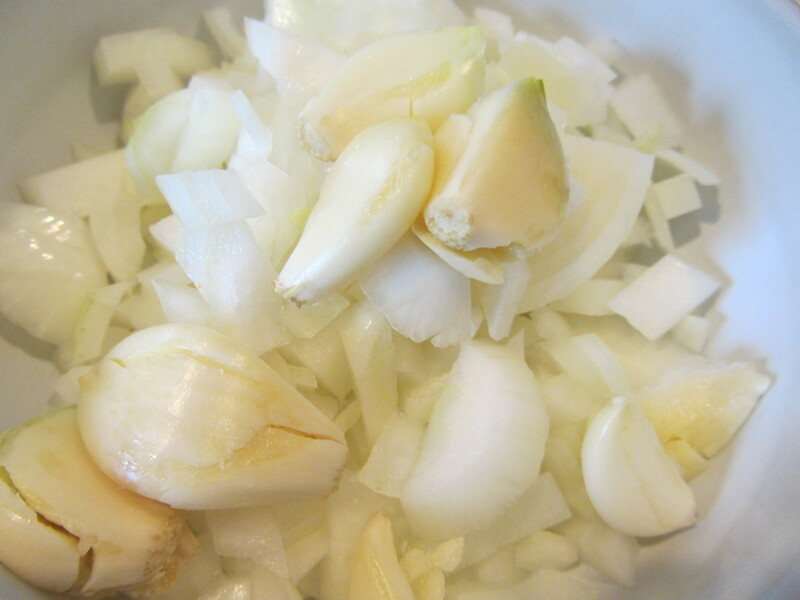 To make Alton’s roast, begin by chopping an onion and peeling/crushing 6 cloves of garlic with a knife. Chopped onion and 6 cloves of garlic, crushed. 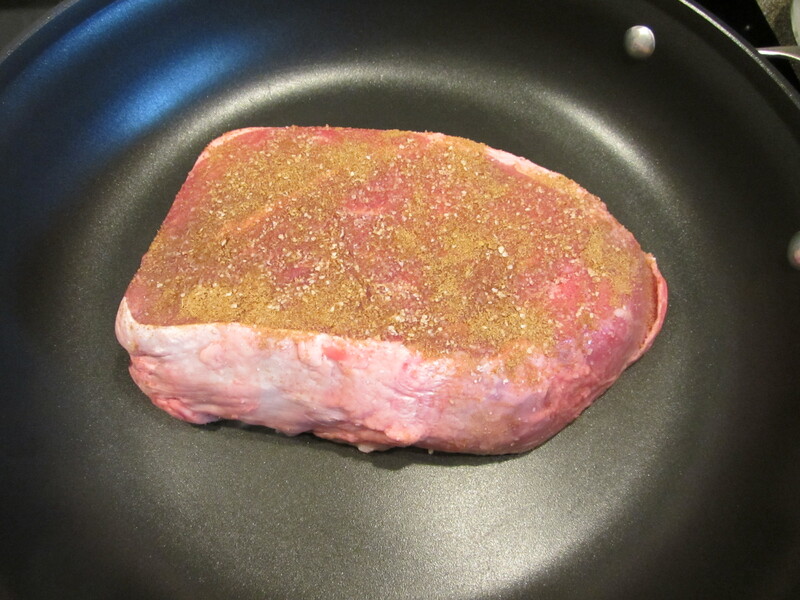 Preheat a large skillet over high heat while you liberally apply cumin and Kosher salt to both sides of the meat. 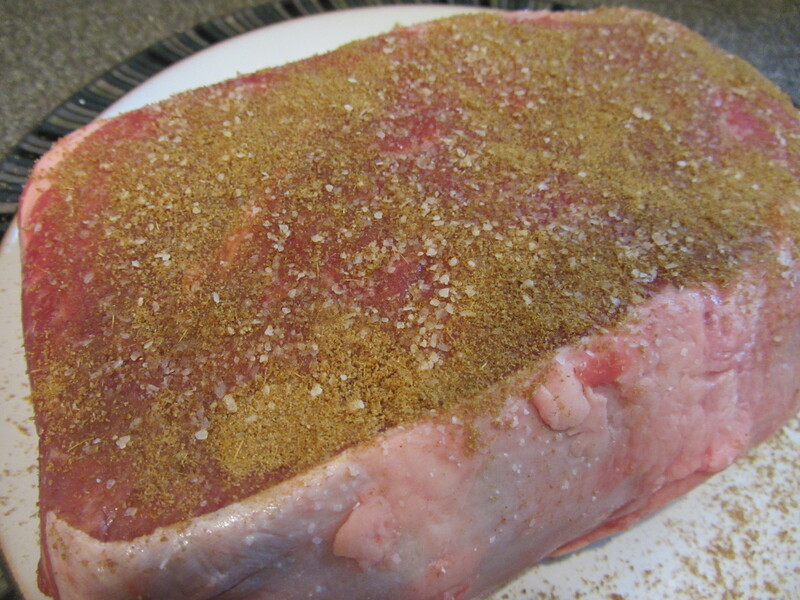 Meat seasoned with cumin and Kosher salt. When the pan is hot, sear the meat for two minutes on the first side and three minutes on the second. You want the meat to be golden brown on both sides. Searing the meat for 2 minutes on the first side and 3 minutes on the second. Remove the meat from the pan, flipping it so the hot side is facing up. 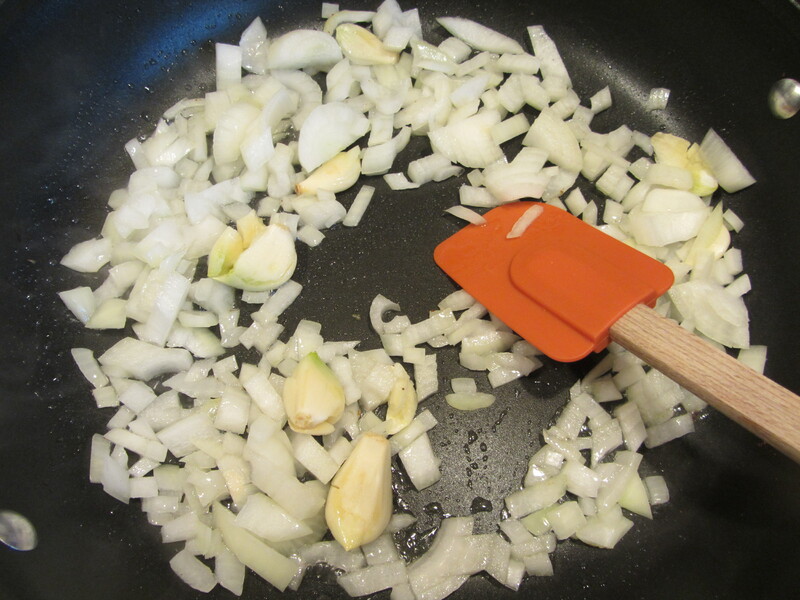 Add 2 T of canola oil to the skillet, along with the onion and garlic, and decrease the heat to low. Onion and garlic added to skillet, along with oil. Once the onion is translucent, add 1 C tomato juice (I used spicy V8), 1/3 C balsamic vinegar, 1/2 C dark raisins, and 1 C green olives. 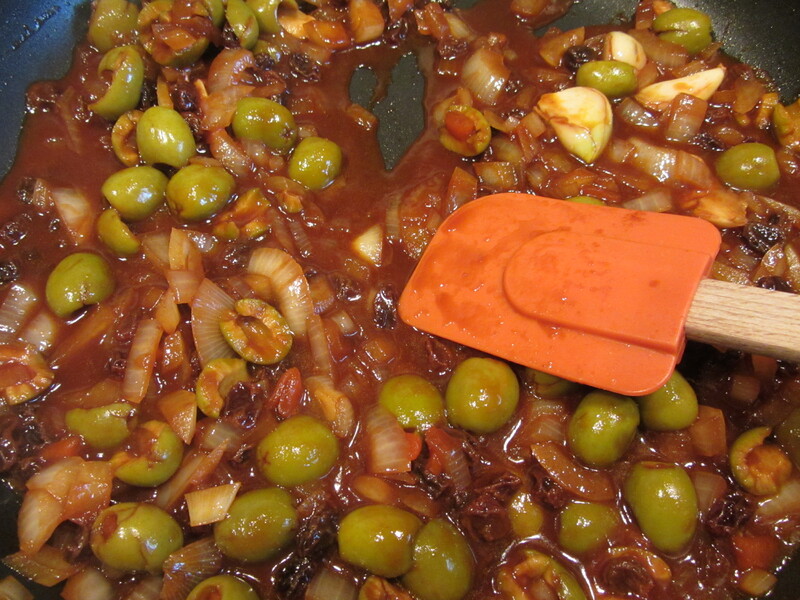 Be sure to lightly crush the olives with your hand as you add them to the pan. 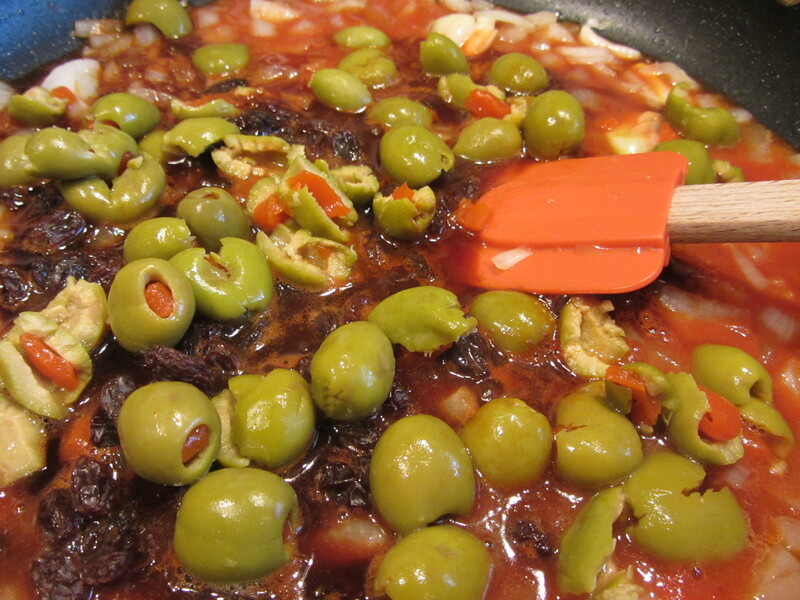 Tomato juice, balsamic vinegar, raisins, and green olives added to pan. Simmer this mixture until it has reduced by half. Olive mixture after reducing by half. 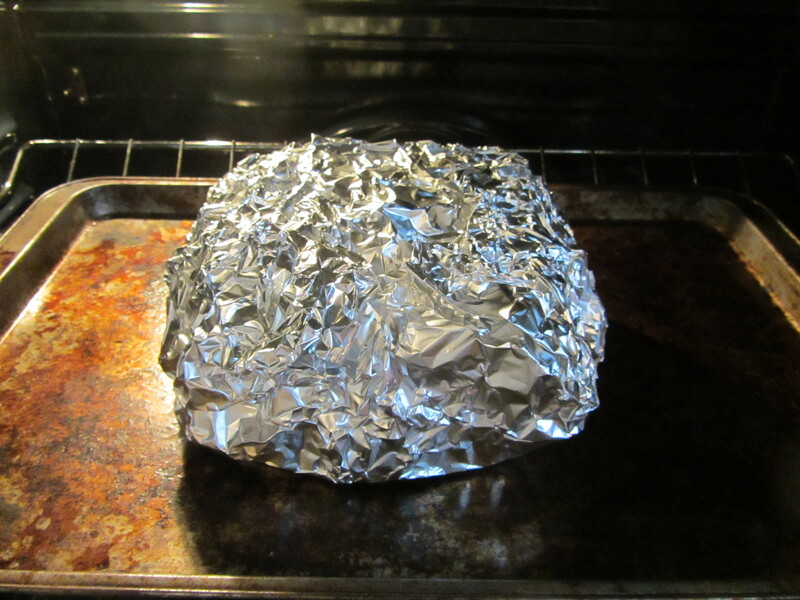 Preheat your oven to 190 degrees and make a pouch of aluminum foil. Pour half of the olive mixture into the bottom of the pouch, place the meat on top, and pour the remaining olive mixture over the meat. 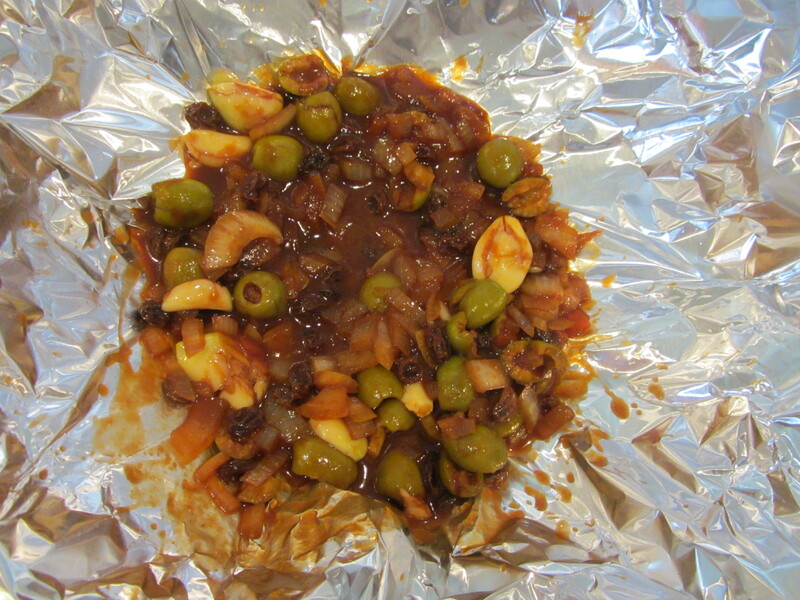 Half of the olive mixture poured in the foil pouch. 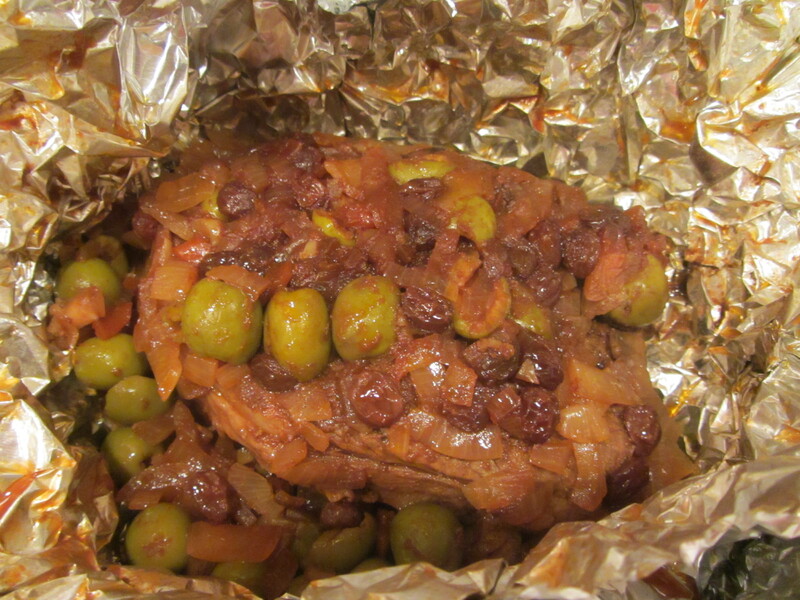 Meat placed on olive mixture. Remaining olive mixture poured over meat. Tightly close the foil around the meat, and wrap the entire bundle with a second layer of foil. Place the roast in the oven for 3 1/2 hours. 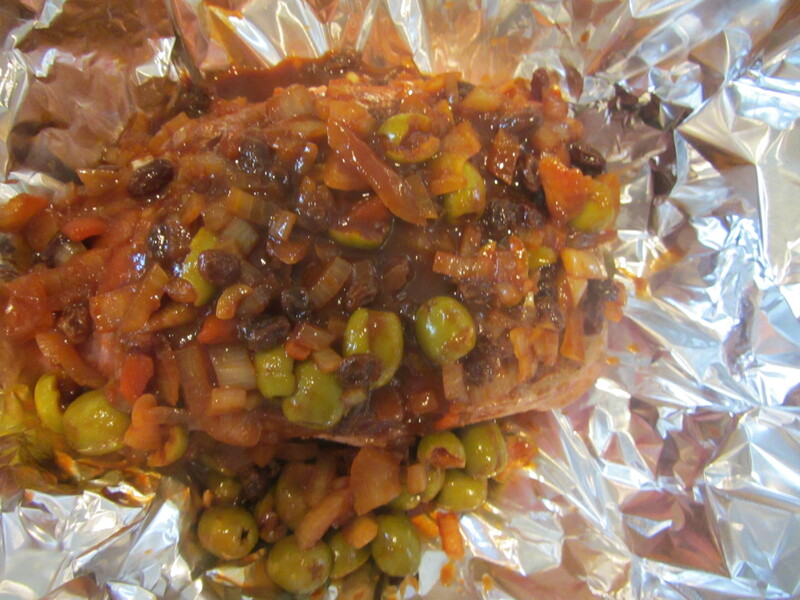 The roast packet, sealed in two layers of foil and put in the oven for 3.5 hours. 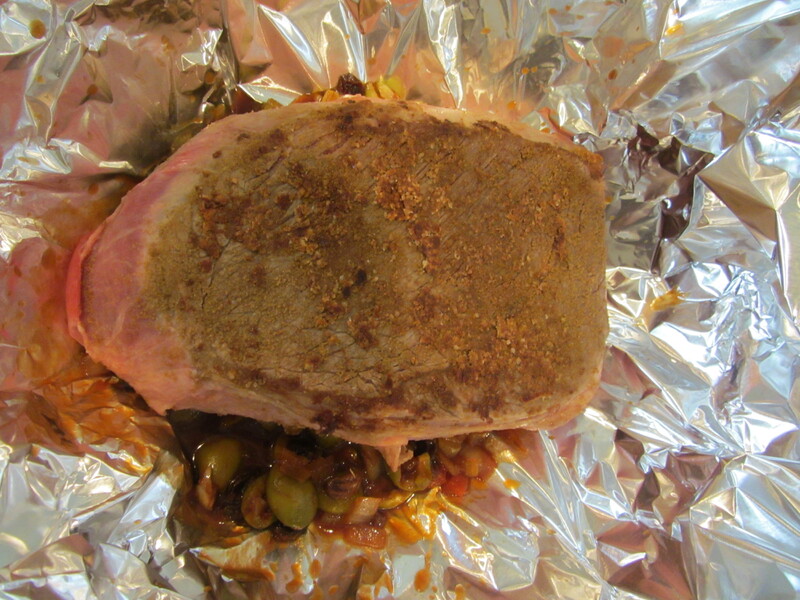 When the cooking time is up, let the meat rest inside the foil for 30 minutes. 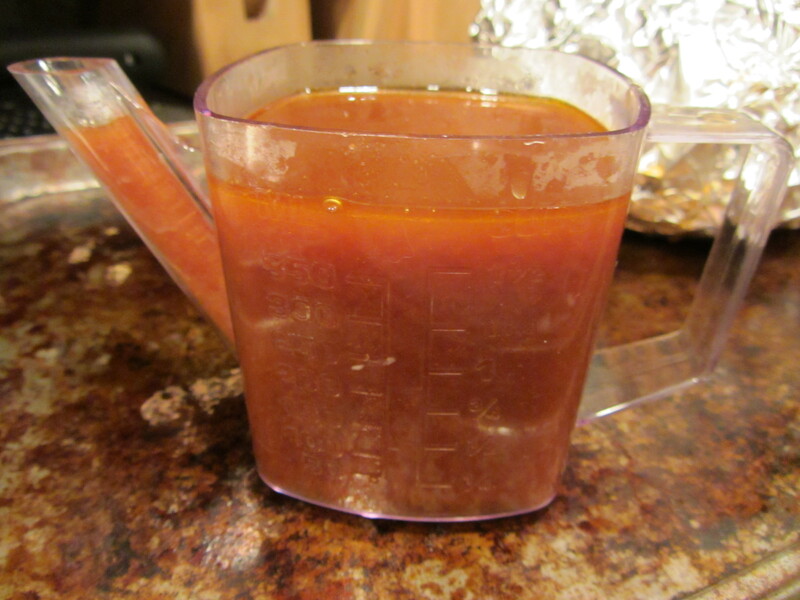 Next, cut one corner of the foil packet and drain the liquid into a gravy separator. Liquid drained from foil pouch to separate fat. Pour the liquid into a blender, discarding the fat, and add the solids (olives, raisins, etc.) from the foil packet. Puree this mixture to a smooth sauce. Slice the roast and serve it with the sauce. Roast after cooking. Olives and raisins added to liquid in a blender. Alton’s pot roast served with sauce. We ate Alton’s pot roast for dinner and we both really liked it. 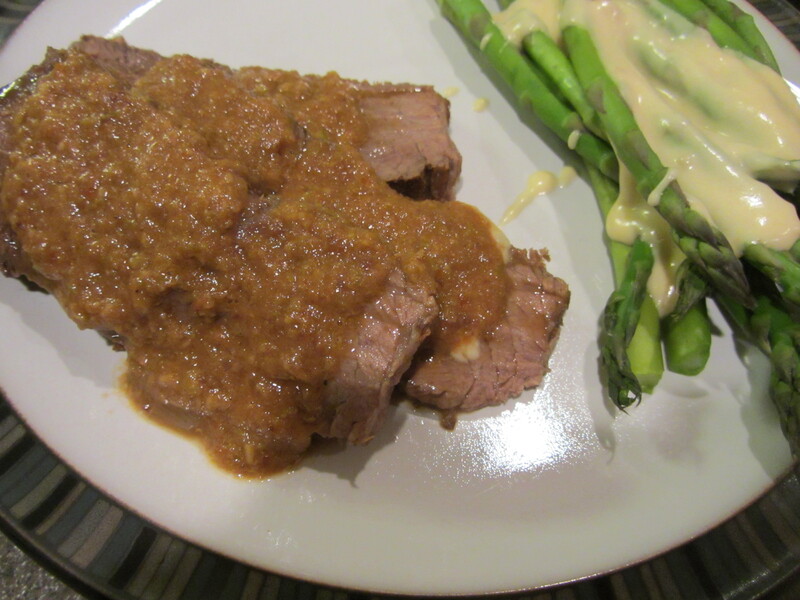 The sauce had fantastic tangy flavor that was delicious with the meat. Traditionalists may poopoo the idea of green olives, raisins, and balsamic vinegar in their pot roast, but I thought the combination was fantastic. I was worried that my meat would not be as tender as I would like, but it turned out super tender and moist. I will absolutely make Alton’s pot roast again, and you should give it a try too.